Social media is a fast moving medium, with updates usually having very short life spans. Which means you need to create new content constantly. And what’s more? You need to create content that gets people to engage. Whether you’re a marketer or a business, this is a pretty much constant struggle: coming up daily with new ideas for social media content – sometimes, for several different social profiles, each requiring their own attention. 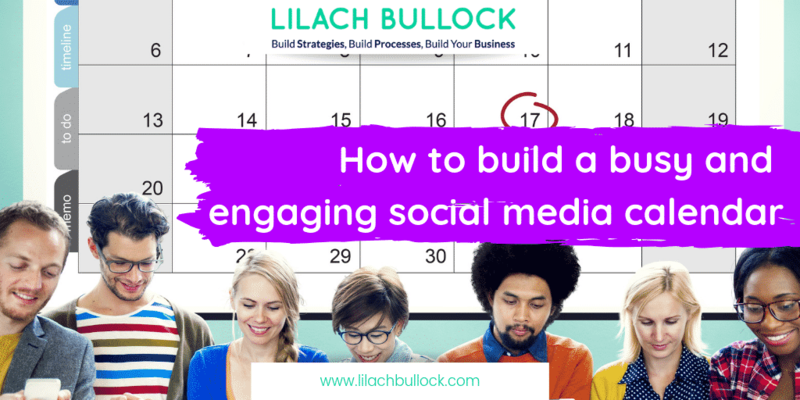 In this blog post, I’m going to show you how to build a busy and engaging social media calendar. Getting people’s attention on social media is getting more and more difficult – whether it’s simply the competition for people’s attention or algorithms – and in order to keep up, you need to not only be consistent but also offer enough variety. That said, there is a good thing about needing more variety: there are so many more types of content that you can share to keep your audience interested. By creating this list of categories that you need to create, you can make sure you’re creating enough “different” updates. To help, you can also colour code each category and make your calendar easier to organise and read. Once you start coming up with ideas – especially if you like to come up with several in one go – make sure to come up with ideas for each (or several) category. So, how do you create all of the content you need to build a social media calendar that gets results? It’s quite simple actually: all you need is a tool to help. I’ve definitely said it before, but I’ll say it again: it’s difficult to come up with all the content you need on a daily basis for your social media. It’s time-consuming and often…a bit infuriating. 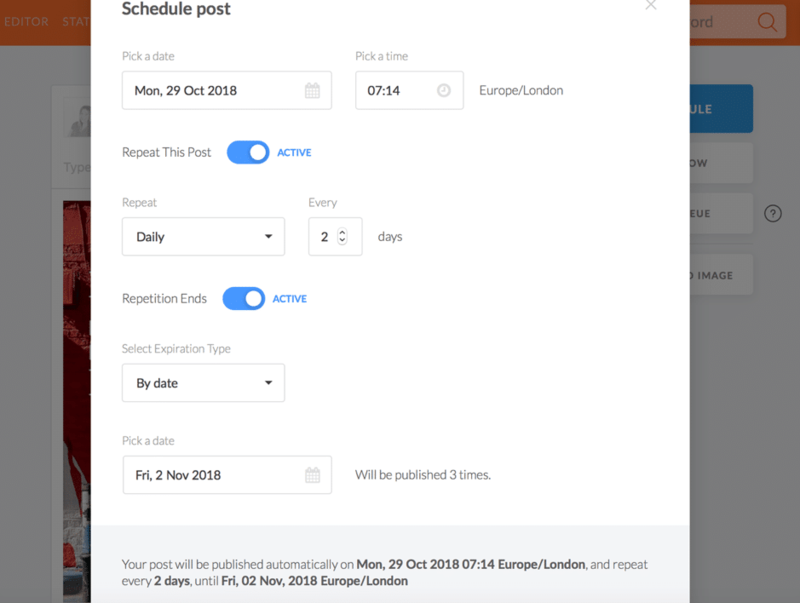 That’s one of the problems that PromoRepublic wants to solve: help you come up with new ideas consistently and keep your social media calendar not only consistent but also fresh. Does it manage to solve this problem? One of my favourite things about PromoRepublic though is all the help you get to create interesting – and diverse – content consistently. Promotional content, such as a sale, a new collection of products or new arrival, promoting a newsletter, etc. You also get a separate tab for content that is recommended specifically for you; when you create your account, you’re asked a few questions about your business so that they can recommend you content based on your needs. In other words, there is a lot of variety for a plethora of top industries. 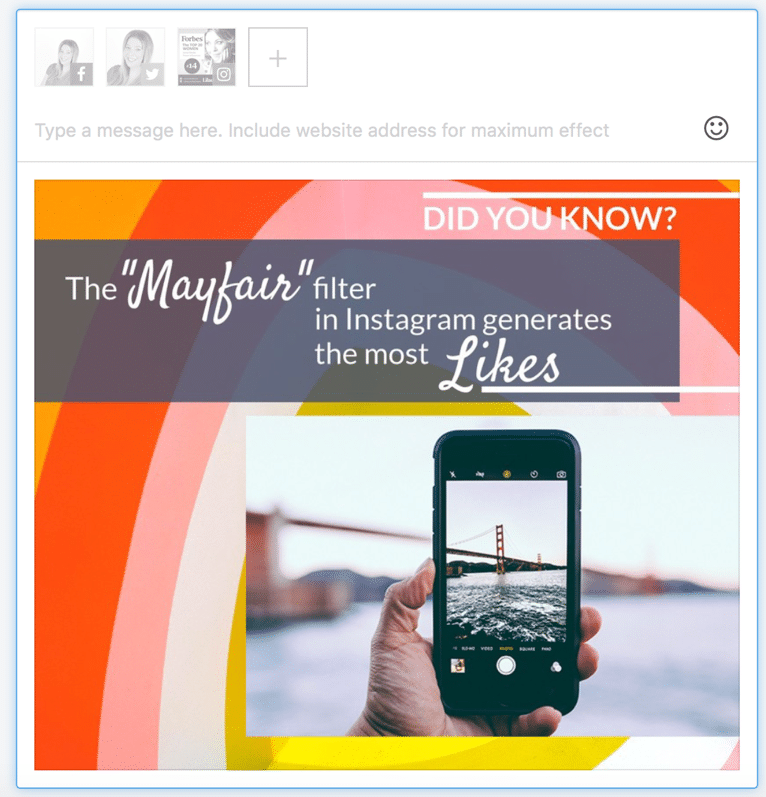 Plus, you can also use this editor to create an image for your social media from scratch. If you manage to create a really cool design that you love, you can save it as a template of sorts as “my ideas” – then, reuse these designs/templates to create new content. The editor is super easy to use and yet has quite a few functions; if you want to be quick and still create content that gets results, it’s definitely a great option. 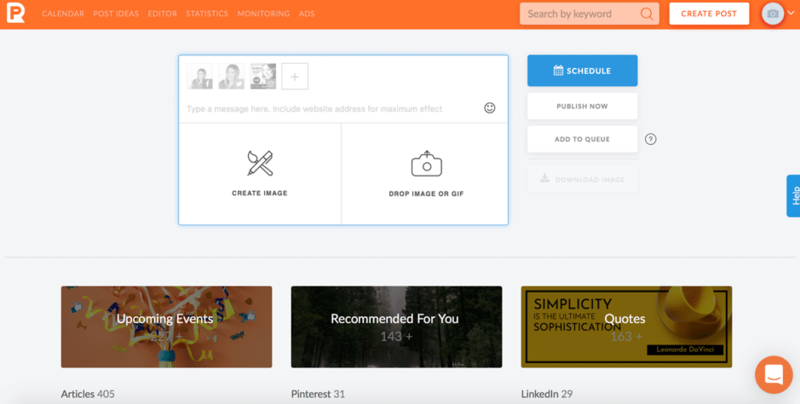 PromoRepublic has quite a few other useful features beyond their library of content and image editor. In fact, you can pretty much use it to manage your social media, including those who work as part of a team as there are collaboration tools as well. Since the tool is focused on social media content, it makes perfect sense that the analytics would be the same: all about your social media posts. As you can see, the stats under your posts help you find out which posts performed better in terms of views (and how many of those are organic views or from ads), number of clicks and visits, likes, comments, and shares. And as you might’ve noticed, in the right hand side of the post, there’s an efficiency score- this tells you how well your update performed. Another option there is “repost”, which, as you might’ve gathered from the name, lets you quickly repost older updates. 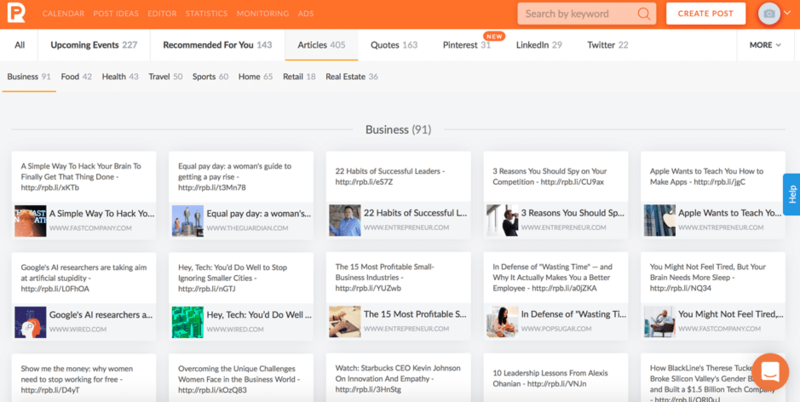 Use this feature to keep getting results from your top-performing content. What are people saying about you on social media? 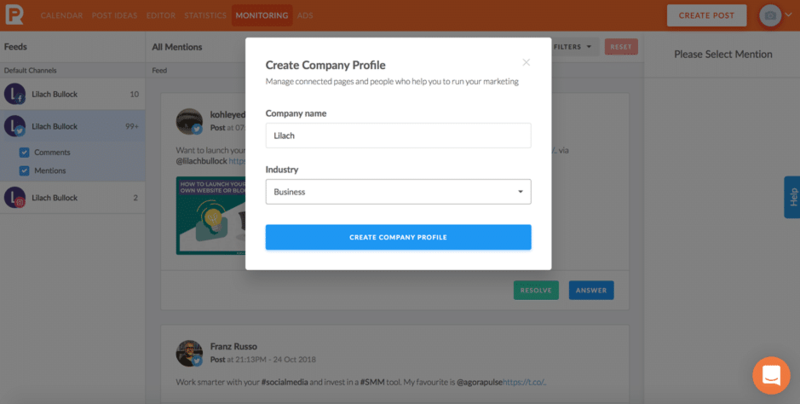 To find out, you can use PromoRepublic to set up monitoring for your different social networks – no social media management tool would be complete without it. As you might notice in the above screenshot, you have 2 options; either ‘resolve’ your mention – meaning, you can remove it from the feed as you don’t need to take any more action – or you can answer. This takes you directly to their post or comment so that you can quickly respond to it. If you work with a bigger team – and/or have a manager or client that needs to check and edit your work – you’ll be happy to know there are several useful collaboration features. 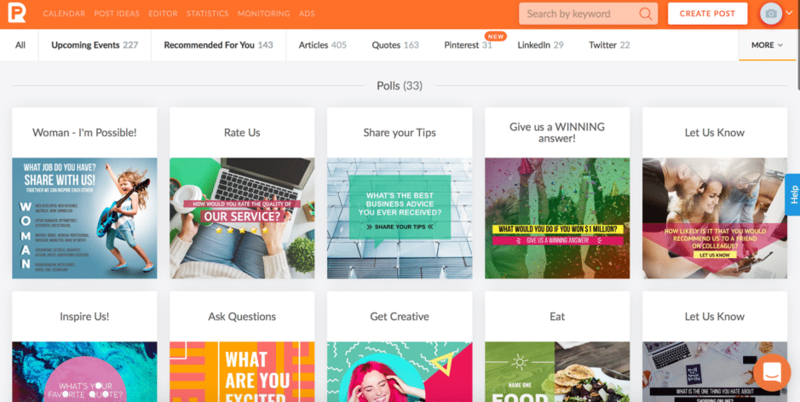 PromoRepublic is a very powerful tool with a plethora of handy features; that said, it’s the content library that really shines. 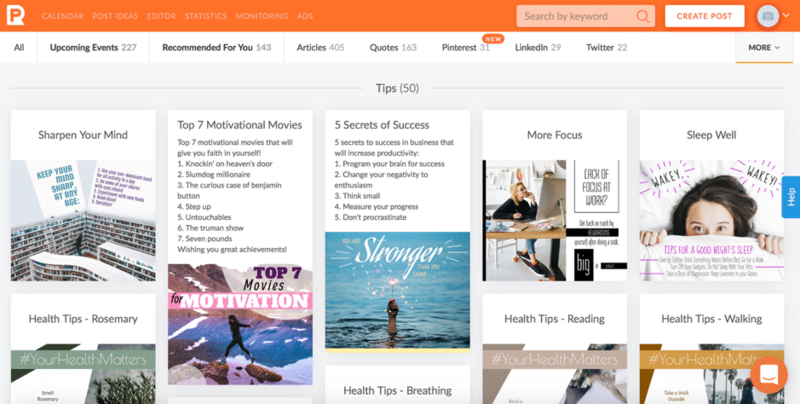 There is so much content, updated regularly, so you can actually create and post fresh content on a daily basis – something which feels impossible to do without a tool like this to help. 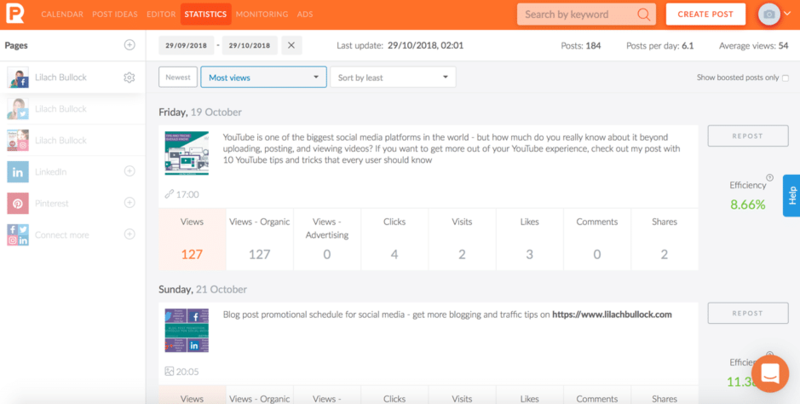 Plus, you get a plethora of other features as well, including the built-in editor, the analytics, and the social media monitoring. Oh, and a very exciting new feature which is currently in Beta, Intelligent Ads, which allows you to run paid ad campaigns with PromoRepublic. Try it for free here.